Some indicators I haven’t discussed in a while are the Quantifiable Edges Volume Spyx indicators. The charts are found on the top of the charts page every night. The calculation for Spyx is proprietary, but basically it looks at volume on a relative basis across multiple securities. When Spyx levels post extremely high readings it suggests an upside edge over the short-term. Extremely low levels suggest a downside edge. Moves below 0 or above 100 are especially suggestive. 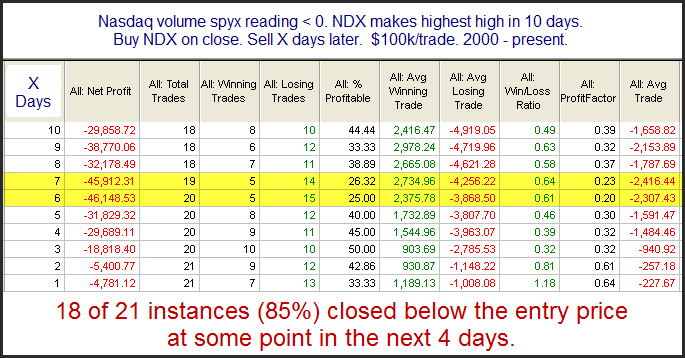 Monday we saw the Nasdaq Volume Spyx come in between -3 and -4. Below is one of several studies from last night's Susbcriber Letter related to this low reading. It shows what happens when an extremely low Spyx reading occurs while the market is making a short-term high. Results here are strong and consistent. 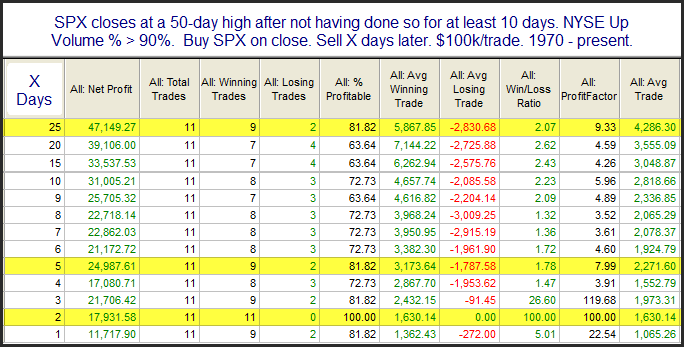 Very low Spyx levels when the market is posting new highs have been greatly suggestive of a pullback in the past. Spyx readings can be found every night in the Quantifiable Edges members section. Gold subscribers may also download full histories of both S&P and Nasdaq Spyx. Files are updated each night. Friday saw the SPY gap up strongly and then never look back. The gap never filled and it closed well above the open. In the 10/15/09 blog I looked at these type of situations when the market also made a 50-day high. I’ve updated that study below. Instances are low here but the results are strong enough for me to take them under consideration. Edit: This post appears not to have made it out at the desired time (almost a day late to my RSS feed). I am using a new blogspot editor and will look into what may have caused this. Apologies. Historically Fed Days have generally had an upside bias. Often when the market closes down on a Fed Day it will bounce soon after. This week we have seen a down Fed Day (Tuesday) followed by 2 more days of selling. I looked at this situation in last night's subscriber letter. While instances are low, there appears to be a decent upside edge. This is especially true on day 1. I discussed some more details in the letter. Those that wish to take a free trial may do so at any time. Here is a link to the free trial. Those who are already registered but would like to do so again may simply send me an email. As long as it has been 6 months since your last trial, you are all set. It is very rare to see a fresh breakout occur on such positive breadth as we saw Monday. In the past it has often led to a successful breakout. Below is a study that examines this. A positive impact can be seen right away. And when looking out 4-5 weeks the risk/reward remains very favorable. The market is certainly very overbought and could pull back at any time. But this is one study suggesting there's a good chance the current momentum begets more buying. There was some unusual action in the VIX on Friday. As many traders are aware, it typically trades counter to the S&P 500. So on days the SPX finishes up the VIX will normally close down. I have shown several times in the past that there are often bearish implications when both the SPX and VIX rise on the same day. One quirk of the VIX is that it has a natural tendency to fall on Friday afternoons and then rise on Monday mornings. So while it is unusual to see both the SPX and VIX rise on the same day, it is especially unusual to see it happen on a Friday. I looked at this scenario last night. In last night's Subscriber Letter I broke down the results a little further by filtering on the long-term SPX trend. I found that while downtrending reactions were more exagerated, occurances during an uptrend were still quite reliable. 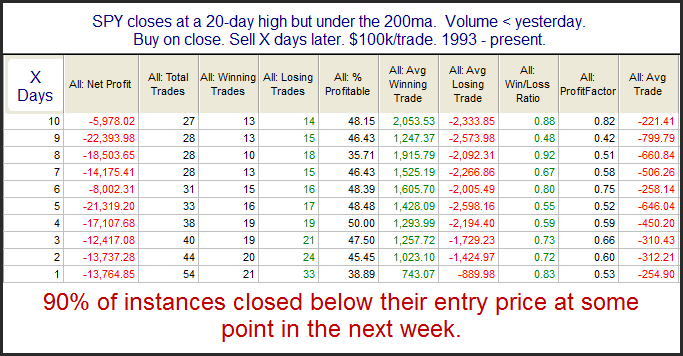 I found it interesting that the SPY put in an outside day and closed down after closing at a short-term high Monday. Outside reversal bars such as Tuesday's are often viewed as bearish by many traders. I ran a study to examine the potential significance of this kind of bar. 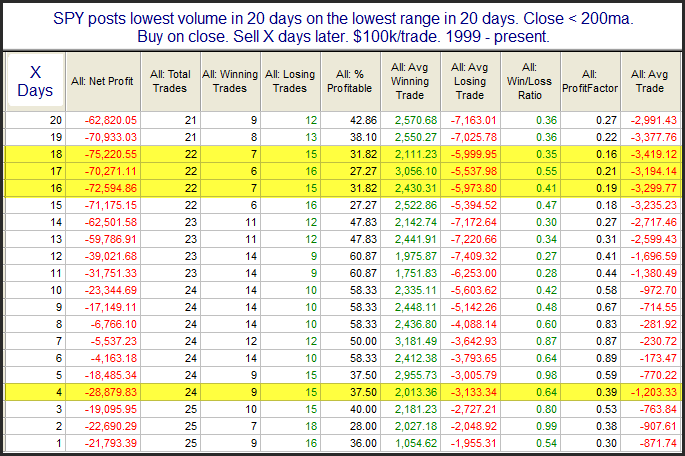 Results here are similar to other studies I’ve run on outside day or key reversal bars in the past. It is often followed by a few days of weakness but it rarely marks the kind of significant top it is renowned for. Recall though that Monday's study did suggest the possibility of an intermediate-term top, so it is a possibility. In any case, a few days of weakness here would be typical. In general very low volume and range when the market is not above its 200ma will lead to a pullback. I showed several studies along these lines in the subscriber letter this weekend. One with both short and intermediate-term implications is below. Stats across the board including Win %, Win:Loss Ratio, Profit Factor, and Average Trade all favor the bears. This is the case not just for a few days but even for a few weeks. The Quantifinder yesterday showed a study that has been shared a few times in the subscriber letter. It looks at intermediate-term highs being acheived on declining volume in a long-term downtrend. The 90% consistency rate for some type of pullback is high and implications certainly seem to favor the bearish case. 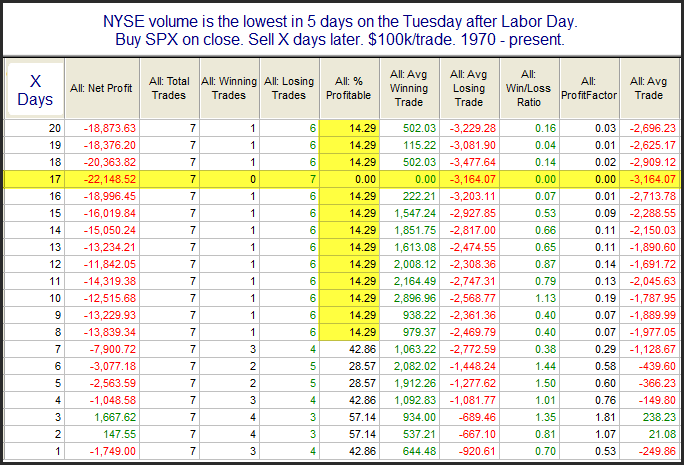 In a post two years ago I discussed how low volume on the Tuesday after Labor Day was often a bad sign. I looked at what happened when 1) volume came in lower than the Friday before Labor Day, and 2) when volume failed to hit the highest level in at least 5 days. Tuesday not only did volume fail to hit the highest level in 5 days, it actually came in at the lowest level of the last 5 days. Since 1970 this has only happened 7 other times. As you’ll see below, it hasn’t been a good sign going forward. Instances are low, and the 1st week has been a bit of a tossup. But when traders fail to show interest after many summer vacations traditionally end, then a move down has always followed. In conjunction with the “August down greater than 4%” study from last week this study seems worth considering. We appear to be getting some warning signs of a September swoon. I'm seeing some evidence suggesting the market has quickly become overdone to the upside and is likely to pull back. Below is one study from last night's subscriber letter that looks at other times the SPX made short-term highs on strong breadth but weak volume while in a long-term downtrend. Instances are very low and prior to 1992 there did not appear to be an edge. So I wouldn't try and extract too much from these results but I do think the recent downward strength and consistency is notable. September has a well-earned reputation as the worst month of the year for the stock market. But with August performing so poorly I wondered how that might affect September’s performance. The SPX finished August down 4.7%. Below I conducted a study showing how September has performed following August returns worse than X%. While we’re not looking at a huge number of instances it does appear that going into September on a bad note in the past has not alleviated any risk. The worse August was the worse September was. 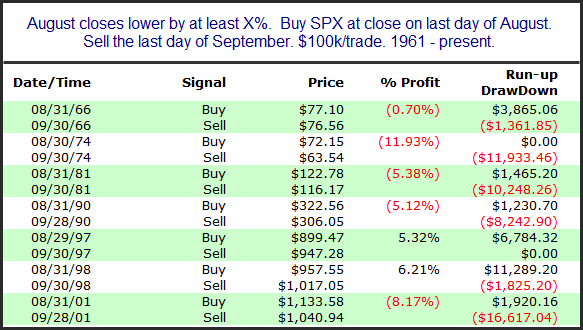 Below I’ve listed the 7 instances where, like now, August finished down over 4%. What stands out to me here is the size of the drawdowns. Four of seven instances saw September swoons of over 8%. While not statistically significant, I do think this is worth considering. For those interested in reading more about September tendencies, I'd suggest checking out the below MarketSci post from yesterday.